Some truly amazing performances went down in the Baltimore finals of American Ninja Warrior 5, many of them by good ninja buddies of mine, so I feel a great deal of pride and joy being able to relay them. After falling on the second-to-last obstacle, the Circle Cross, in the Baltimore qualifying round I sat in the stands and watched the Baltimore finalists throwdown in the freezing cold later that same night. My selections of the top stories here are somewhat biased by my personal relationships, and the limitations of not having DVRed the competition and being forced to jot down my notes without the benefit of rewatching anything, so please forgive (and correct) any limitations or inaccuracies in my reporting. Dan “GravityForged” Galicynski Takes Top Time – Before I get started on his performance, I have to say that I’ve long thought “GravityForged” is one of the best nicknames in the ninja world. Dan proved that he’s deserving of such a cool nickname by cruising through the course with a calm consistent speed that had him hitting the final button just a split second ahead of second-place finisher Joe Moravsky. With much of the commentary in American Ninja Warrior 5 centering on “Parkour versus Rock-Climbing” people are overlooking that gymnastics is an amazing and applicable background for ninja obstacle activities. GravityForged, the 2010 college champion in the floor exercise for Penn State, reminded people of that reality with his strong performance. Dan’s a great guy, and after having failed at the Warped Wall in American Ninja 2, 3 and 4, this was a much deserved breakout performance by this great athlete. Salmon Ladder Still Slays Ninjas – American Ninja Warrior 5 witnessed a change of most of the obstacles for brand-new ones never before tested in competition. Personally I loved this development, as well as how the producers were wise enough to still keep three iconic obstacles that are emblematic of the Ninja Warrior experience – the Quad/Quint Steps to start it off, the Warped Wall to end the qualifying course, and the Salmon Ladder to kick off the extended course for the regional/city finals. More than any other obstacle, fans of the show bring up the Salmon Ladder to me in conversation as one that just blows their mind. Although there are many Salmon Ladders in gyms and backgrounds across the nation at this point, the Salmon Ladder still slays top ninjas in competition all the time. Witness Brent Steffensen, American Ninja Warrior 4’s top ninja, fall on it in the Venice Finals this season. The Baltimore Finals were no exception as many talented ninjas (and friends of mine) fell on it including Elet Hall (fastest time in qualifiers), Chris DiGangi, Brandon Mears, and Justin Conway. Rookie Joe “The Weatherman” Moravsky Delivers – Joe Moravsky, a professional weatherman who helped all the Baltimore ninjas interpret and deal with a massive weatherfront that postponed the competition for a full day, proved that rookies can deliver the goods with his incredible performances in both the Baltimore qualifying and finals rounds. Looking like a seasoned veteran he cruised through the finals course, pausing to throw a side-flip off of the end of the Body Prop before moving on to the Spider Climb. Although I wonder if he regrets this now since he finished just a split second behind GravityForged for the top time and a $5k top finisher bounty. Regardless of this point, I think we can stop calling Joe a rookie, and I anticipate seeing him as a top competitor for many seasons to come. Mike Bernardo Believes He Can Fly – In perhaps the most spectacular wipeout of the season, and destined to become a staple of highlight clips for seasons to come, 33 year old DC firefighter Mike Bernardo misjudged his high dismount from the Rumbling Dice and ate some serious mat before bouncing back into the water. Unfortunately the difference between advancing to the National Finals and ending his season was sticking that dismount. 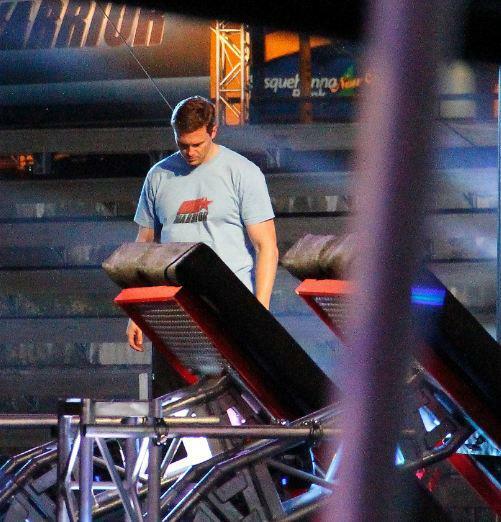 Mike is an incredibly strong and intense competitor, and somebody who I have known since American Ninja Warrior 2, so I expect this to be fuel for his raging fire and drive him to greater heights in future seasons. Mike also has a great ability to laugh at himself, and has been cracking his friends up with self-deprecating jokes about this dismount ever since, so he has many many ninjas rooting for his future success. Tim “LiveWire” Shieff – The 2-time world parkour champ couldn’t make it through the Body Prop to my shock. Tim has handstand press strength for days, witness his YouTube videos of one-hand hand-stands and walking through subways on his hands, and he “just got tired” as he told Jen Brown on the sidelines. When Tim fell is when I realized that doing the Body Prop at the end of this tough course must have been brutal. Travis “Sunset Hogan” Weinand – Representing the tall folks (Travis is 6′ 5″), talented artists, and meathead heavy metal thrashers, Travis’ impressive run ended on the Body Prop. Travis is an incredibly strong competitor, and when he chuckled dryly on the Body Prop as he realized he was running out of gas was when I realized that the Body Prop can sap the strength out of even the most powerful ninjas. Mike “Bedroom Ninja” Needham – Mike Needham is a favorite of both fans and competitors alike, and his walkon story ended heroically with him advancing to the National Finals. With perhaps the best ninja nickname for picking up chicks, the “Bedroom Ninja” ended his run on the Body Prop like many other worthy competitors. Mike earned his nickname with his amazing training setup in his bedroom that has driven his YouTube channel to over a million views of his training videos. Mike reminds me of my favorite Sasuke competitor, Yuuji Urushihara, with his size (115 lbs), drive (intense), and humility (admirable). Adam “Megaman” Grossman – Another member of the self-described meathead crew from Chris Wilczewski’s The Movement Lab, Adam Grossman also fell on the Body Prop after a great run. Adam has earned his nickname Megaman from his ridiculous leaping ability and overall strength, and joined his fellow “Labbers” Travis Weinand and Mike Needham in the water under the Body Prop. Brian Represents for the Wilczewski Clan – Brian Wilczewski, younger brother of famous ninja Chris Wilczewski, stepped out into the limelight on his own in American Ninja Warrior 5 in his first year of eligibility. Chris, like me, fell on the Circle Cross in the qualifying round of the Baltimore competition, but Brian picked up the family torch and carried it to Las Vegas by finishing with the 3rd fastest time in the city finals. One thing that needs a bit of correction is the representation in the Baltimore qualifying episodes that there is a sibling rivalry between the two – in fact there is nothing but love and support that I’ve ever witnessed, and for the last couple of years Chris has been openly bragging about how awesome Brian is, how Brian is even better than he is, and how he can’t wait until Brian turns 21 and can show the world. Chris is a super-supportive big brother, and I know nobody was prouder than he was when Brian hit the button at the top of the Spider Climb and advanced to Vegas. Andrew Lowes Also Represents Gymnasts – Andrew Lowes, a National Finalist in American Ninja Warrior 4, also advanced to the National Finals again this year with another strong performance. Andrew is a great guy, and trained this past season with a “fire in his belly” to improve his performance, and I was psyched to watch him achieve his goal of getting back to Mt Midoriyama. Andrew, like GravityForged, is another accomplished gymnast, and is part of the gymnast clan (including Travis Rosen from Miami) who reminds everyone that gymnasts deserve to be in the conversation along with parkour athletes and rock-climbers as top ninjas from specific training disciplines. Wow. Words are going to fail here describing how insanely fun this past weekend was competing in Baltimore for American Ninja Warrior 5. So surreal and immersive, and a roller-coaster ride of adrenaline and aspiration that was only tethered to the earth by the amazing camaraderie and humor of my ninja brothers and sisters who I was sharing the experience with. Unfortunately I can’t tell how I did, as we are all bound by confidentiality about results until the season airs this summer, but before I got totally swept away back into the tides of my “regular life” I wanted to pause and be thankful for being able to have such an amazing experience with some truly great people. CASTING & PRODUCTION – I’ll begin by saying that it was an honor and a thrill to be invited to compete in American Ninja Warrior 5. Even though it is my fourth season competing I never take the opportunity for granted, and if anything feel increasingly lucky every year that I get to be a part of this great competition and community. So I want to be certain I give a huge THANK YOU to the American Ninja Warrior production and casting team that invited me to participate again this year, and did an absolutely amazing job both before and during the event managing the logistics and fragile dreams of a growing horde of applicants and competitors. Particular thanks goes to Sabrina Hybel, my main casting contact, who handled not only me but many others with a deft professional and personal touch. Also big thanks to Phil, Matt, Jeff, and Andrea are also due (forgive me for overlooking others who played important roles). Thank you guys! NINJA BROTHERS & SISTERS – I’d be totally remiss and missing out on a big part of what makes the American Ninja Warrior experience special if I didn’t shout to the heavens “LOVE YOU GUYS!” to all my fellow ninja brothers and sisters. The amount of encouragement and support I’ve gotten from fellow contestants has been humbling, and I cherish their friendship. Although I love me some obstacle course running, the best thing of this experience has been the friends made and experiences shared with them. It’s funny, some of these people you know for a few seasons just from online boards and Facebook groups, and forget that you’ve never met in person, so it was awesome to finally meet in person great people like Luis Moco, Bradley “B-Nice” Smith, Tom Hutchman, Dan “GravityForged” Galiczynski, Travis Weinand, Noel Reyes, Mike Needham, Jesse “The Jet” Villareal, Adam Grossman, Tim Shieff, Brandon Willis, Gabriel Arnold, Seth Caskey, Michelle Warnky, Chris DiGangi, Chris Zurcher, Justin Conway, Beth Higginbotham, Sarah Williams, TJ Allcot, Mike Ciardi, Aric Lee, and many others to build those friendships (forgive me those I left out here!). It was also great to spend more time with existing buddies like Chris Wilczewski, Jamie Rahn, Mike Bernardo, Andrew Lowes, Andrew Karsen, Eric Sietsema, Nick Kostner, Brian Wilczewski, and others to further build those bonds. Your friendship and humor made the weekend incredible fun. I also want to specifically thank The Warrior Lab family (now The Movement Lab), and particularly the ring-leader Chris Wilczewski, for including me in their family and fun for this experience, hanging with you guys was “awesome sauce” (to quote Chris Z). A shoutout to the Lab “support crew” of Charles Kokolskyj, Rachel Carlton, Kaitlin Flip, and Kaitlin Faunce. THE EXPERIENCE – Now this is a bit more amorphous than thanking casting & production, and my fellow ninjas, but I am deeply grateful for the broader experience of simply participating in something like American Ninja Warrior. This year was incredibly competitive to just get a spot to compete with a reduction in run slots being magnified by a huge spike in submissions from wannabe ninjas fueled by the NBC network exposure of two primetime series focusing on American Ninja Warrior 4 airing in the last 9 months. Even though I had competed in the 3 previous seasons, it was not a given at all that I would be invited back to compete. Many many very qualified committed ninjas who were veterans and even stars of previous seasons did not get invited back. I’m very grateful and humbled to have been invited back to ANW5. I’ve summed up what American Ninja Warrior means to me in other posts, so I won’t bore you with a broad treatment of that here, but I will say that I’ve been truly surprised by all the rewarding positive things I’ve gotten out of this experience of being a competitor. For a middle-aged dad with serious responsibilities as a father-of-three and a businessman, having something so fun, physical, and playful has added an amazing and fun dimension to my life experience, and has been an profound vehicle of lessons for my three young sons. Not only does it make them appreciate their dad more (not too many middle-aged dads play on the playgrounds with their kids like I do! ), but they also learn key life lessons about trying your best, and hard ones like even when you try your best you sometimes fail. As my oldest son (7 years old) has observed, if you try really difficult obstacles sometimes you fall in the water. And even falling in the water in itself can be a valuable life experience. So…American Ninja Warrior…thank you for this great experience! Re-reading this blog, I was right at the start. Words failed me. Even as long as this blog post is, there were many things left unsaid. One thing I do want to acknowledge is the hard luck of many folks who waited for days to try and get a walkon spot to run the course. Fate (and rain) conspired against you, and only 6 of you got to run when at least 20 expected to out of a line well over a hundred. Tough luck, and my heart goes out to you, but I admire your will to compete and what you were willing to do to go after your dreams. Even if you didn’t get to run this year, those attributes are priceless in life and will benefit you in great ways down the road, so don’t despair! Great things lie ahead.